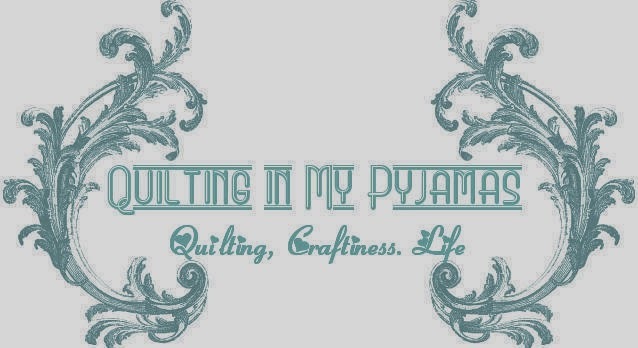 Quilting in My Pyjamas: Finished ! Once upon a time (around about the same time as the invention of the wheel) I saw a clamshell quilt and decided that I was filing that idea away for future reference. From time to time I came back to the idea and then shoved it straight back into the "too hard" basket. All that cutting - all that basting - all that appliqueing and all that quilting just put me right off. Yep- basically I'm lazy. I knew I'd get about 10% of the way in and end up with a UFO on my hands that I'd probably be finishing in the nursing home. Solution- a mini quilt -which would give me a chance to see if I liked the process enough to do a full sized quilt ( at some point in the distant future-have you seen how many other projects I have on the go at the moment?) and would have the added bonus of yielding something pretty to put on my sewing room wall. In my infinite wisdom I decided this would be my first hand quilting project too. It's done - I'm happy. But this is going to be an only child! But what a beautiful only child it is! It is a lovely child! Even if it doesn't have any siblings, will it get a playmate occasionally? I think it's beautiful! You might change your mind, this one will get lonely! It is lovely! Good thinking to make it smaller. What a pretty project to enjoy! That's a brilliant idea... I'm going to use that idea for my pink, yellow and lime green Grandmother's Flower Garden (hexie project). It'll be a dolly quilt. Ah... but it is lovely isn't it? Who says you have to make full sized quilts all the time? This is PERFECT for your sewing room. No need to duplicate something that puts a smile on your face. You've done good. This looks like a very happy decoration. Enjoy admiring your creation. SO HAPPY FOR YOU SHAY!!! ok sorry about that but I knew you could do it! 1 project down! I'm so proud!!! it's beautiful...as parents we all say that once in our lives..but there is always that Ooops...I did it again clause when you end up with "another one"...LOL enjoy your bundle of clams! It's beautiful, Shay. What a nice feeling it is to finish a project. Not that I would know, necessarily:-) I'm guessing. I have looked at this pattern, thankyou for making the decision for me, I will not be attempting this. I had wondered how findly this would be. Love your effort, love the fabrics. It is so pretty. I love clam shell quilts but they look like a crap ton of work. I do have a pattern pinned for a clam shell with larger clams and I think (hope) it's pieced. Sewing larger curves doesn't seem as daunting as appliqueing the little effers, but it remains to be seen whether I ever pull the trigger and buy the pattern (much less start the quilt). Anyway, I digress from the point of the comment, which is good for you for finishing your cute mini! Only children are special! What a lovely word. Finished! And so is your finish. Lovely I mean. Small and perfect. well done! What a great creative solution. Looks great Shay but I bet it was a hell of a lot of work. I don't think I would have the patience. Agreed! A beautiful only child. Sometimes one is enough. I really like it, especially the colors you used and the black border. Very, very nice. So pleased for you that you were able to make this on a small scale so that you could decided whether you would make another. I am right with you on not doing a repeat. I think a lot about the cutting out, stitching, basting for applique projects and it is usually enough to tell me not to go there. What a great little quilt! Very smart to keep it small so the finish would be very timely and exciting. :) I have one on my list too. Hmm... wonder if I should downsize mine too? Fantastic! It wouldn't be any fun if it was easy! A perfect project to hang on your wall. You did good!!!! I love how you've framed it too. It's really pretty and now that you've made one, I don't have to! Very nicely done! Congrats on finding a way to run your experiment and have a finish too. Hey you did it. And you found out you don´t wanna do it again. Perfect! And what a cute Little wall hanging. Love it, it is super cute! Very nice and SO smart to do it in a "mini" version. I did that with a double wedding ring. Six rings and I called it done! Did you name it yet? I vote for 'Happy as a Clam' b/c it makes me smile when I look at your beautiful wall hanging. :) It's bright & cheerful. I'm sure it will bring you years of grins. Excellent idea to do a mini version of a quilt. That is so pretty! You obviously gave this only child all the best that was in you! I love the colors! And yay for a finish. Also, I'm kind of a schmuck for not commenting right away. I read your posts and then want to say something thoughtful so that you know I read the post and didn't just skim and look at the pictures. So I leave your blog open in my browser to remind me to come back and comment. And then three weeks goes by. Anyway, love the clamshell mini (and there's still time to link up for October finishes. Fantastic idea, a mini quilt. I think I need to do that more so that I actually complete some quilts. By the way I just realized that I haven't been getting your blog feed on blog lovin and am catching up now. I don't know why. I've missed reading your great writing!